Netori Johnson, Cedar Grove OG/OT 6’4” 348 lbs. Netori graded out 90% on defense with 3 TFL and 5 tackles total. He graded out on offense at 94%, in 26 pass attempts he did not give up any sack or pressure he ended up with 5 pancakes and moved to tackle to convert an 18 yd screenplay. 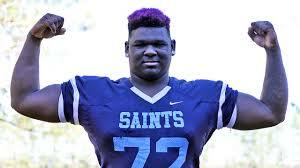 Netori has given his verbal to UGA.